Living with boys made me lazy. My husband would just as soon see me dressed in fleece as in flowered nightshirts. Having a little girl has piqued my femininity, though. I will be her first model of womanhood--a model that, however practical, probably shouldn't wear white tube socks. I use the second closet in my little girl's room. What better way to get it organized than with a feminine new look? The challenge: to do it all without a trip to the store. Below, the closet "before" photo. So Meredith, when do we get to see the "after" picture? It's still in progress! Hopefully I will have it completed after naptime this afternoon. can i just say I LOVE THAT CHAIR!!!! 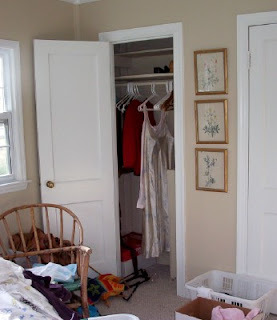 A feminine girly girl closet...That's a great idea!